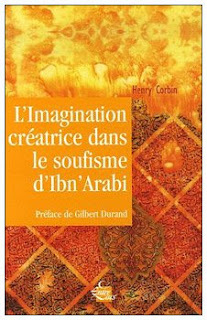 First published in French as L’Imagination Creatrice dans le Soufisme d’Ibn ‘Arabi this profoundly moving and beautiful volume stands as one of the great works of theology and comparative philosophy of the 20th century. Among the more than 200 critical editions, translations, books and articles published in his lifetime, his magnum opus is without doubt the four volume En islam iranien: Aspects spirituels et philosophiques, Paris: Gallimard, 1971-73. But this has not yet been translated and its scope and magnitude make it ill-suited as an introduction to his work. Creative Imagination is the most comprehensive and accessible guide to the profoundly important and powerful spiritual treasures to be found in his writings. It is indispensible for those seeking a deeper understanding of the religious imagination and the relations among Judaism, Christianity and Islam in the modern world. Indeed, a close reading of this text may provide something of an initiation for those hoping to enter into the visionary tradition which Corbin's work represents. A recent review here is evidence of the continuing relevance and accessibility of this masterpiece of the thought of the Heart. My soul will find comfort in it. My spirit will drink the cup. Will still impregnate the garment of my soul. Which has been the confidant of my hidden secrets. Part One was originally delivered as “Sympathie et théophanie chez les ‘Fideles d’Amour’ en Islam,” at the 1955 Eranos Conference, and published in Der Mensch und die Sympathie aller Dinge, Vorträge gehalten auf der Eranos-Tagung in Ascona, 24 August bis 1 September 1955; Eranos-Jahrbuch XXIV/1955, Rhein-Verlag, Zürich, 1956. Part Two was delivered as “Imagination creatrice et prière creatrice dans le soufisme d’Ibn Arabi,” and published in Der Mensch und das Schöpferische, Vorträge gehalten auf der Eranos-Tagung in Ascona 22 bis 30 August 1956; Eranos-Jahrbuch XXV/1956; Rhein-Verlag, Zürich, 1957. An introduction was added and the complete work first appeared as L’Imagination Creatrice dans le Soufisme d’Ibn ‘Arabi, Paris: Flammarion, 1958. The most recent French edition (Broché, 2006) has a preface by Gilbert Durand. (The announcement here has a good short biography of Corbin in French). 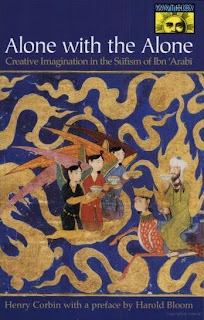 The first English edition appeared as Creative Imagination in the Sufism of Ibn ‘Arabi. Translated from the French by Ralph Manheim. Bollingen Series XCI. Princeton: Princeton University Press, 1969; 1st paperback printing in 1981. 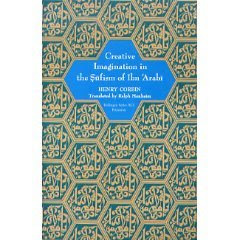 The volume was re-issued by Princeton University Press in 1997 as Alone with the Alone: Creative Imagination in the Sufism of Ibn ‘Arabi (A Google Book Search Link) with an Introduction by Harold Bloom. 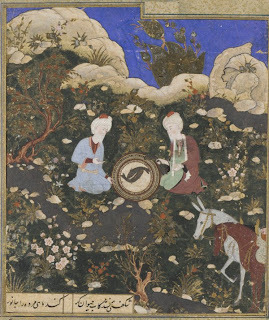 1 Elijah and Khidr at the Fountain of Life. 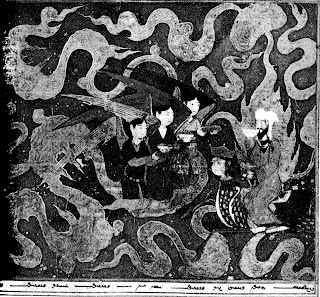 Persian, School of Herat, late fifteenth century. Freer Gallery of Art. Facing page 56. 2 The Philoxeny of Abraham. 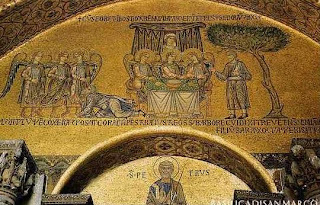 Detail from a mosaic, Cathedral of St. Mark, Venice, thirteenth century. Facing page 136. 3 Joseph and His Brothers in Egypt. 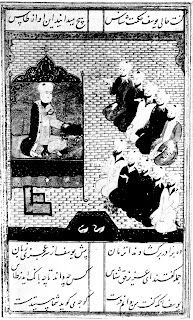 Persian miniature from Fariduddin Attar, Mantiq al-Tayr. Staatsbiliothek, Marburg, MS or. oct. 268, fol. 114, fifteenth century. Facing page 232. 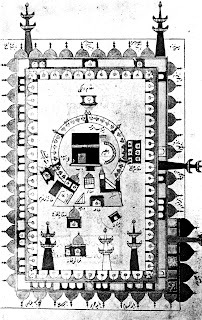 "Corbin performed the great service of introducing the Western world to many uniquely Islamic ways of expressing philosophical positions, but it is beyond the capacity of a single individual to bring out everything worthy of consideration. Moreover, in his zeal to revive the honor due to the imaginal realm, Corbin tended to de-emphasize the cornerstone of Islamic teachings, tawid, the 'declaration of God's Unity.' It is as if Corbin was so entranced by the recovery of the imaginal that he had difficulty seeing beyond it. From the point of view of the Islamic intellectual tradition, the tendency to become transfixed by the multiple apparitions of the One represents a danger inherent in the current revival of interest in imagination. It is clear, for example, that certain varieties of Jungianism divinize the imaginal world, giving to the soul an autonomous status never granted to it by the great traditions. Man's own domain of microcosmic imagination is posited as the Real, since 'God' is merely the soul's projection. But this - in the Islamic view - is to fall into the error of associating other gods with God (shirk), the opposite of tawid. We are left with polytheistic multiplicity, and the 'gods' are reinstated as real entities possessing insuperable differences. Corbin never fell into such a position, which would have betrayed the central teaching of the texts with which he was concerned. Nevertheless, if his approach to Islamic thought is to be understood as reflecting the concerns of his sources, it needs to be tempered by more attention to the ultimate Unity lying behind the theophanic facade of created existence." (William Chittick, The Sufi Path of Knowledge: Ibn 'Arabi's Metaphysics of the Imagination, Albany: SUNY Press, 1989, x.). "Corbin's rhetorical flourishes and passion for his subject put his work into a unique category... [He] is concerned with his own philosophical project... Any reader of Creative Imagination soon begins to wonder where Ibn al-Arabi ends and Corbin begins. The lines are not clear, especially if one does not have access to the Arabic texts. Certainly we come to realize that Ibn al-Arabi is a precious larder from which all sorts of delicious vittles can be extracted. But most people familiar with the original texts would agree that Corbin has highly individual tastes." (Chittick, xix). In the years since Corbin's death there has been an enormous amount of scholarly work devoted to Ibn 'Arabi in Europe and the US. For an entry into this vast universe see the Ibn ‘Arabi Society. It is in the end not only his vast contribution to our knowledge of Islamic mystical traditions, but the power and beauty of Corbin's unique "philosophical project" and his own visionary Imagination that guarantee his lasting significance for modern theology, philosophy and spirituality. Corbin makes it clear that the individual, like Jung's concept of individuation, is the great frontier of human spritual assent. Would that we had the courage to explore our own best instincts,and to let go of all, but what we were meant to be. Jesus comforts his disciples. 'You know the way to the place where I am going'. I've only read a little Corbin, and that was only because Tom said at the start to All the World that it was his main purpose. I'm not so sure, because I'd have been lost without Tom's work. The three are vital reading, that said I'd read what your guide suggests first!